The Acer neoTouch offers a small amount of storage - about 300MB. This is barely sufficient and you'll definitely find yourself needing a higher-capacity microSD card. The file manager is the standard Windows Mobile one and won't surprise anyone. Acer neoTouch offers two galleries available from the Multimedia folder in the Start menu. The first one is the standard Windows Mobile 6.5, which is the same is 6.1, except for the touch optimized menu. It has no accelerometer features and you can't flick scroll images. The Album app is a new addition by Acer and may not be something innovative or beautiful, but is still better than the WinMo one. It's touch optimized and has accelerometer auto-rotation. Once the image is opened, you can zoom in or out or continue to the previous/next by sweeping a finger on the current one. Scrolling to the next image is smooth and instantaneous with a single sweep of the finger. Unfortunately Acer did not include any music or video player and left the users with the embedded Windows Media player. As usual it's horrible at managing playlists with your favorite songs, and generally it has limited functionality and the interface is less than touch-friendly. Watching varied video content is almost a no-go as there is a limited number of supported video formats. Unless you really want to leave that Snapdragon sleeping in its lair, you may want to install a third-party multimedia player such as Core player. It successfully played all DivX/Xvid movies up to HD resolution, except those which use the AC3 audio codec. Well, we have to admit that the neoTouch disappointed us when it came to HD. We expected most of the HD videos to play smoothly with that Snapdragon core inside, but we were so wrong. 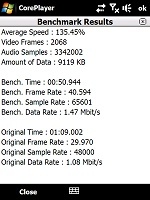 The official DivX HD commercials reached 15-16 fps only, while the videos recorded by Omnia HD hit the 19 fps mark. And that's as high as it went. Anyway if you can skip the HD playback (it doesn't really make sense on a mobile screen anyway), you will be happy to know that all other videos we tried played smoothly with no audio problems or dropped frames. We ran some benchmarks with the Core Player against the HTC Touch Diamond and here are the results. As you can see, the difference is similar with the Spb benchmark results we did before. The Acer neoTouch built-in FM radio naturally requires the headset to be plugged-in. The neoTouch FM radio has an excellent interface and offers memory for 20 radio stations. RDS is available too - so overall, radio is handled pretty well on the Acer neoTouch. Now that caught us totally off guard. Not only is the audio quality of the Acer neoTouch very good for a first attempt, but it is great all over. In fact not too many of the handset we have tested can rival the neoTouch balanced output, let alone the WinMo ones. 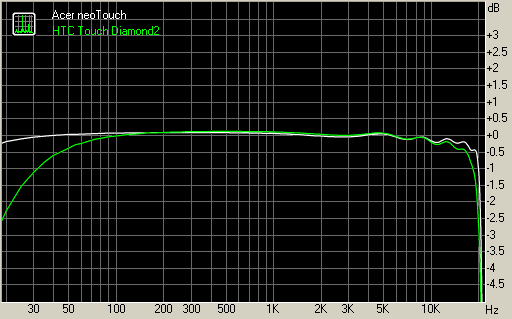 The frequency response graph is virtually perfect throughout the audible range. 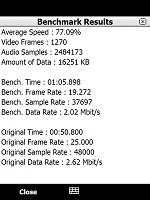 The noise level, dynamic range and stereo crosstalk results are also some way above the average others achieve in this test. And here goes a table comparing the Acer neoTouch to some of its competitors.